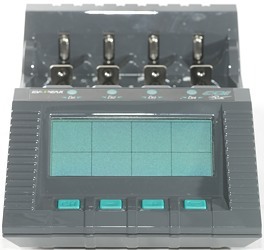 This is a 4 channel analyzing charger and usb charger. 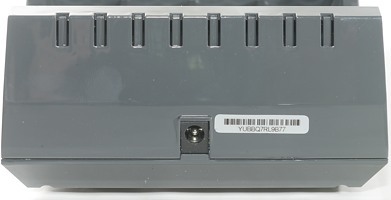 The usb output connector can be used for charging, it is mains powered. As all analyzing charger it has a display and a couple of buttons. There is also a row of blue leds at the top, when a slot is selected it will flash and it will light when the slot is busy. Selftest during powerup shows all the text on the display. The charger has the usual sliders to handle any length batteries, they work from 34mm to 72mm, but are too loose at 34mm to always securely handle 16340 and 18350 cells. 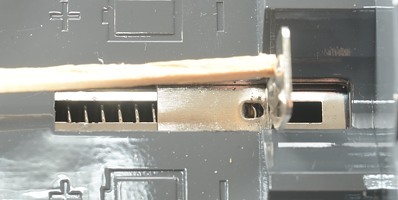 They are not sliding that well either and a long battery must not be pressed against the bottom of the charger when pressing back (I will catch on the moldings, at the position the slider is on the photo). 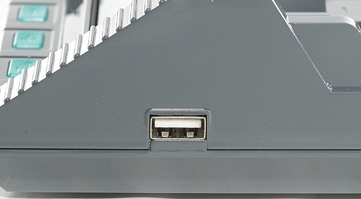 There is some small connectors at the bottom, they can be used to charger other batteries with. They are probably in parallel with charging slot. 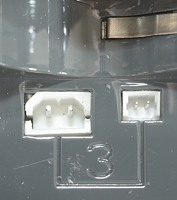 The termination conditions in the charger can be adjusted at it will remember the settings when power is removed. There are separate settings for each slot. To activate setting menu for a slot hold the CH button down. I have used the default values for the testing. 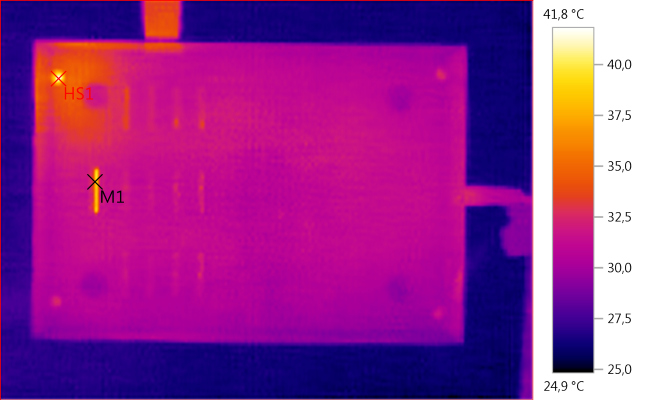 Setting maximum temperature (TEMP) defaults to 55° and can be adjusted from 55°C to 70°C in 1°C steps. 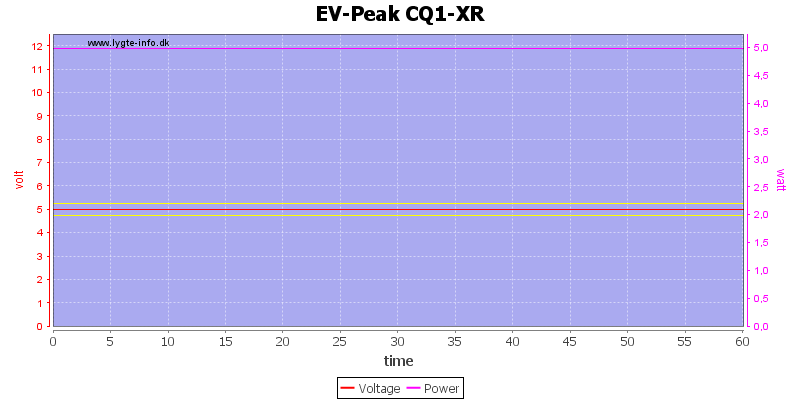 Power consumption when idle is 1.4 watt (Power adapter is 0.1 watt). At 0.3V a battery is detected. Voltage display is within 0.01 volt. 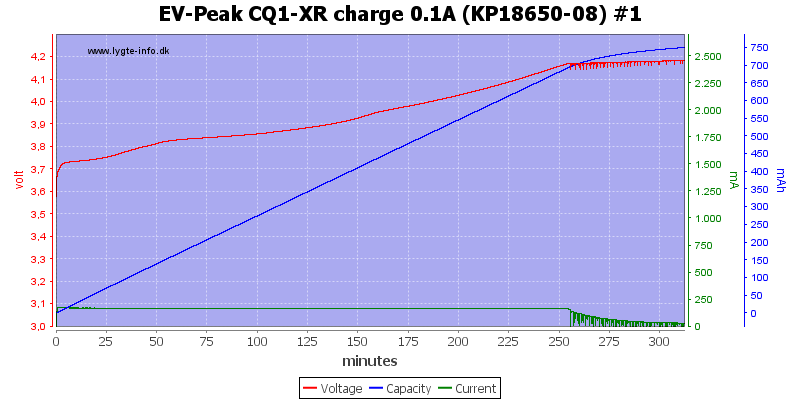 Charge rate has large tolerances. 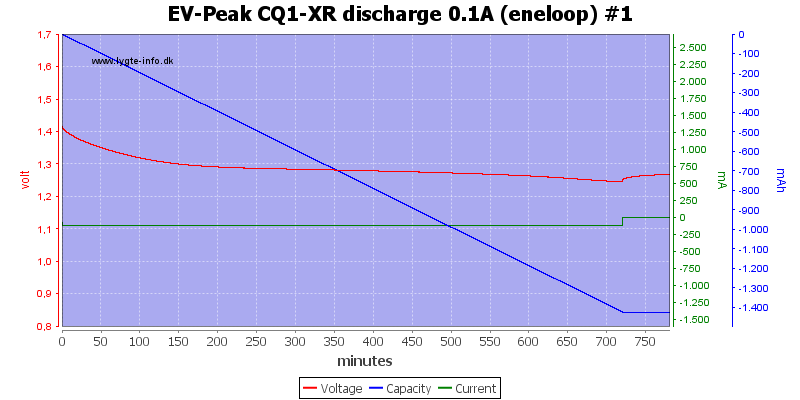 Will discharge NiMH batteries with about 0.1mA when not powered (1.2V). 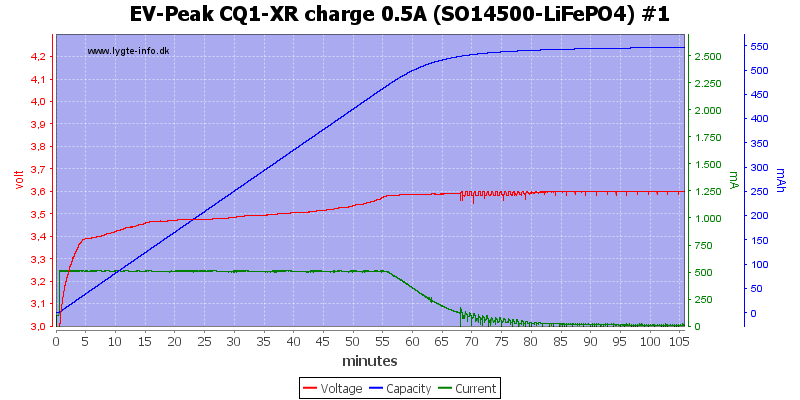 Will discharge LiFePO4 batteries with about 3.8mA when not powered (3.4V). Will discharge LiIon batteries with about 8.2mA when not powered (4.0V). Will trickle charge a full LiIon cell. 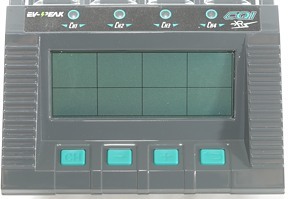 The charge mode can select from 0.1A to 2.5A current. 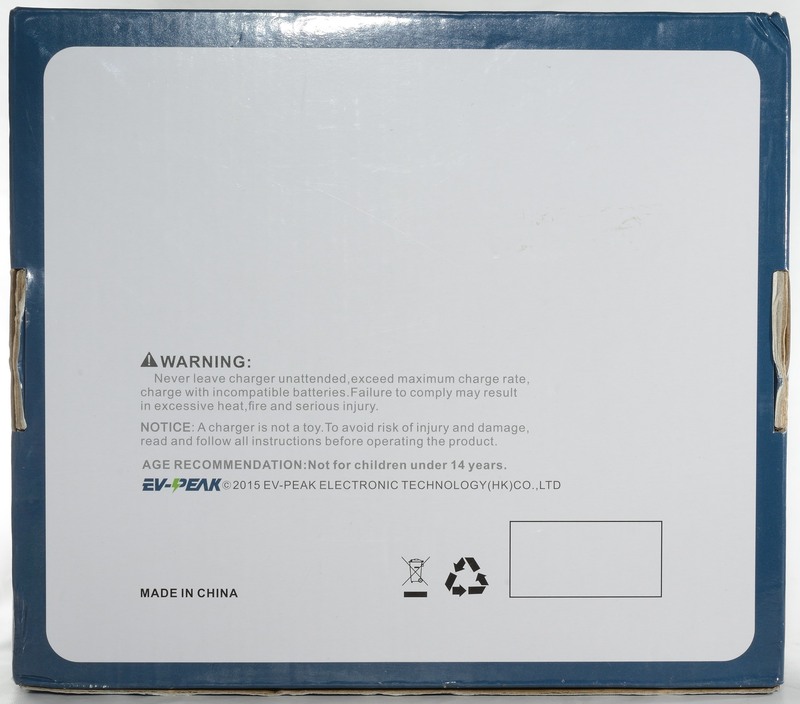 Be careful with chemistry selection, depending on charge state it will select either LIFE or LIPO, the correct one is LIPO. 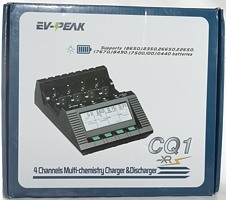 The charger uses a CC/CV charge profile, but it do not turn the current off when finished, there is some trickle charge. Not much difference between channels. 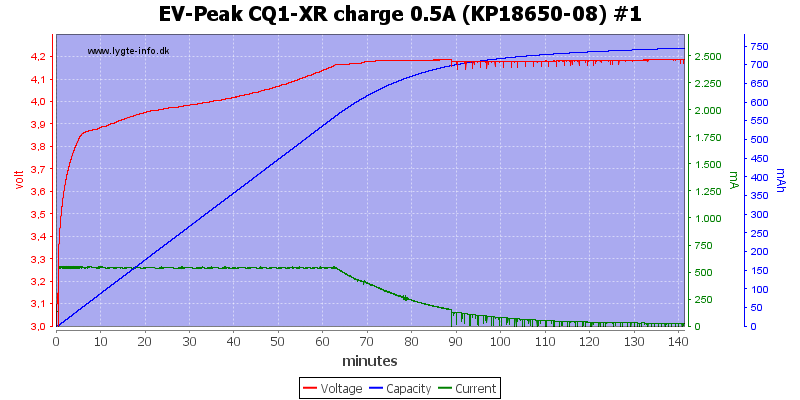 The charge profile is the same with the other cells. With an old cell it is more difficult to see the actual change from charge to trickle charge. 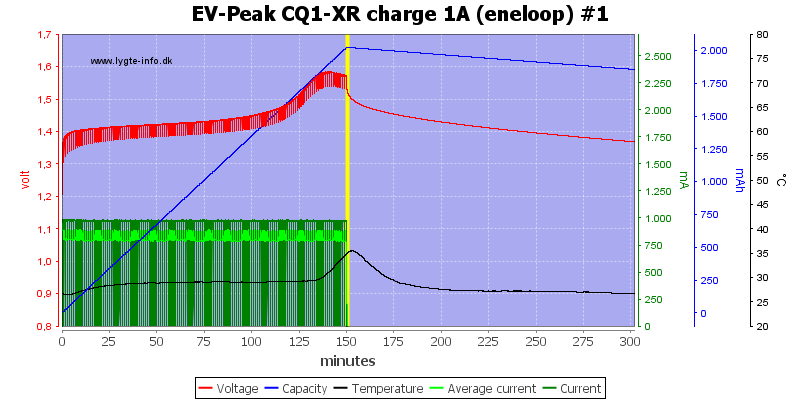 At 2.5A it changes to trickle charge at about the same current as 1A charge do. 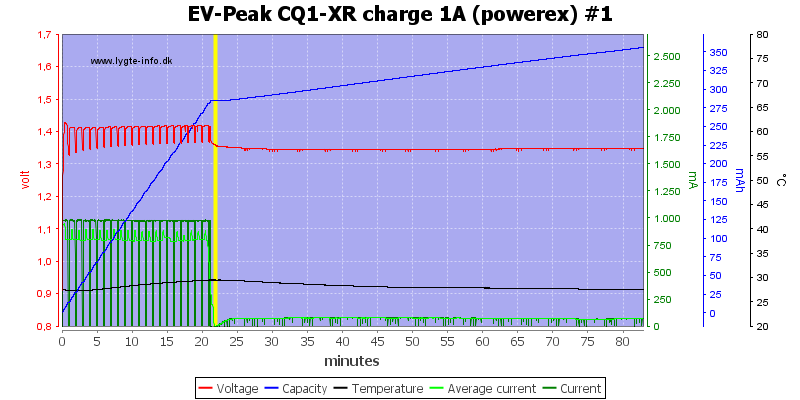 The 0.1A charge is a bit above 0.1A and the CV phase is skipped, it goes directly to trickle charge. 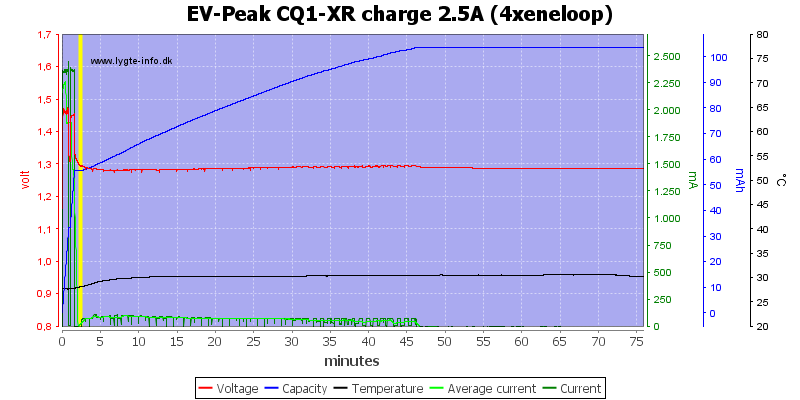 The smaller cells goes from the CV phase to trickle charge at about the same current. With larger cell the current will drop a bit. Charging four cells failed, the charger will reset itself and stop charging. When the charger is started it will first check Ri, then apply a low current for about 30 seconds, before going to full charge current. There is no PWM in the charger current. 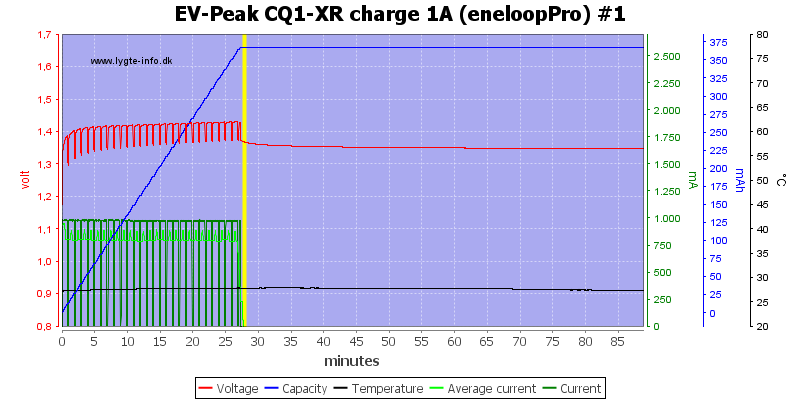 A check at 1A did not show any PWM either, but there is a lot of noise in the charge current. All chargers has noise in the current and I usual apply a filter, it is applied here. And 0.1A is also without PWM. 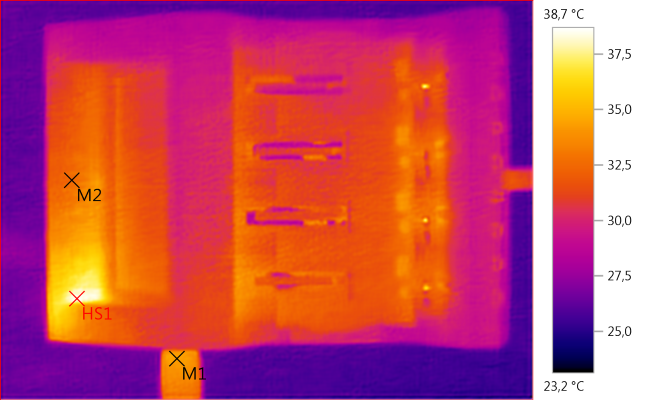 Here is a closer look at the Ri measuring discharge, it is done at about 420mA for 0.1 second. I was a bit curious about the noise and switches my scope to spectrum, as can be seen the switcher is at about 30kHz, there is also a lot of noise at lower frequencies (The above do not show all of them), probably due to the regulation. 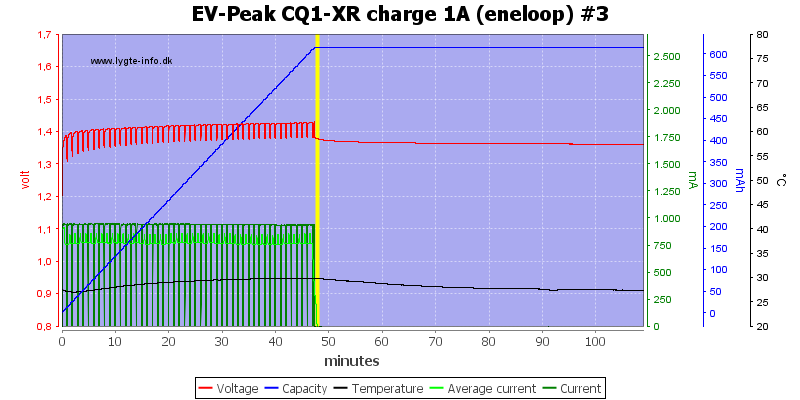 Here is a image of the current/voltage when the charger is reporting END. Negative current means the charger is charging. 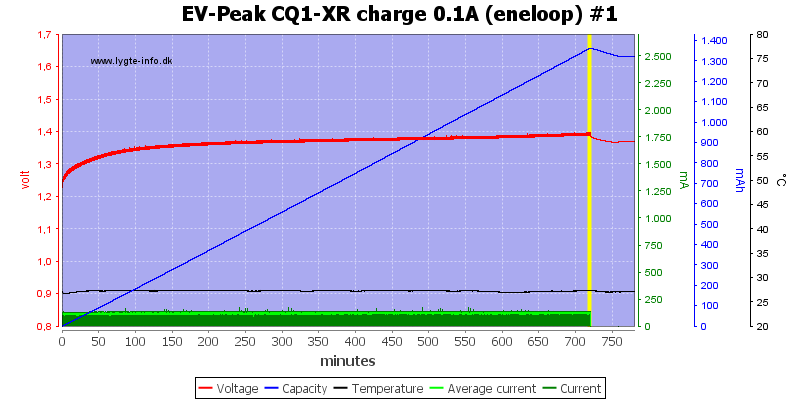 This chart is done with a battery voltage at 4.1V, the current will be reduced at higher battery voltages. 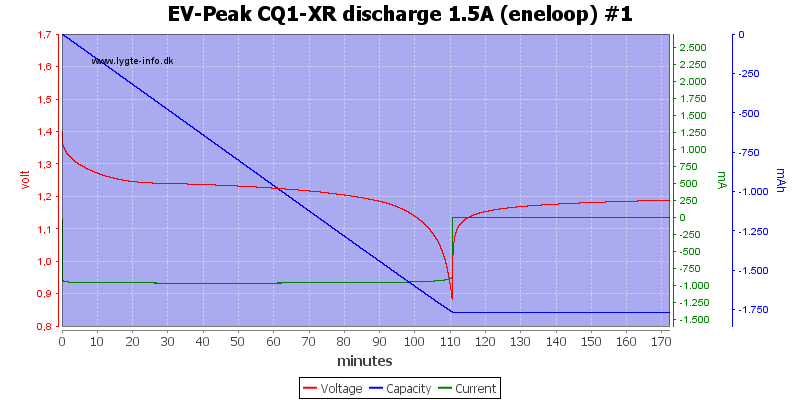 Discharge current can be selected from 0.1A to 1.5A, but as can be seen below it is mostly a fake selection. 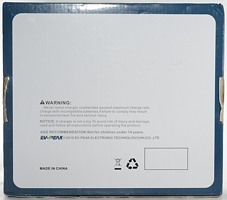 On the back of the charger it says 4x1.5W discharge, this limits discharge current to 0.35A with full LiIon batteries. That limit is not incorporated in the user interface. Here I selected 0.5A discharge, but the charger is only discharging with about 300mA. The discharge stops at 3.35V (This is a fairly high voltage). The test was done with only one battery in the charger. 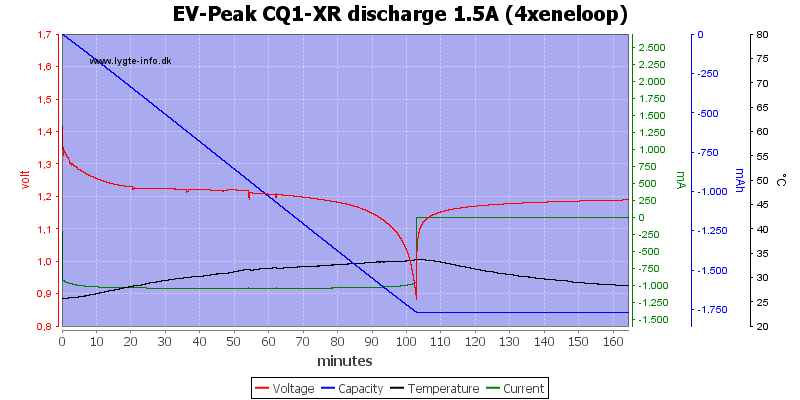 Another discharge with maximum discharge current selected, i.e. 1.5A. Again the current is around 300mA. At 0.1A discharge current the actual current is near the selected current (It is around 90mA, but display on charger toggles between 0.10A and 0.15A). Another check with the 1.5A setting. With cycle setting it is possible to select number of cycles (1-12) and both charge and discharge current and charge/discharge sequence. 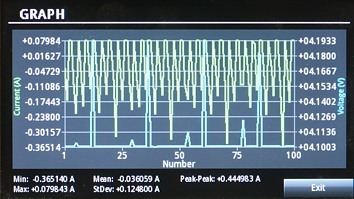 The display shows the discharge from all discharge cycles. I used 1A for both charge and discharge, selected charge then discharge, this means I finish with an empty battery. 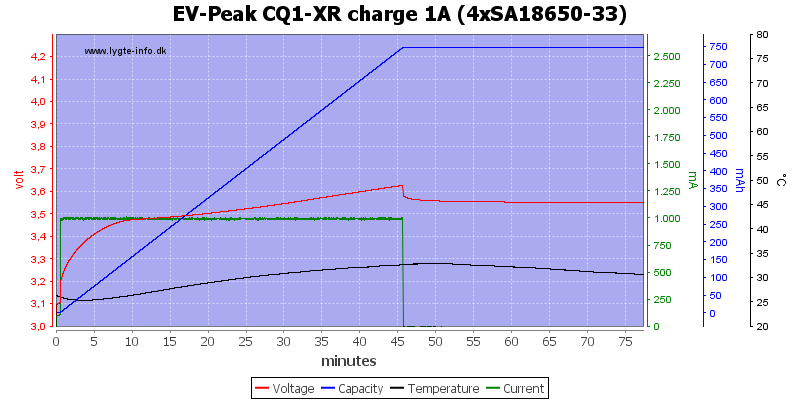 The 1A charge works fine, but not the 1A discharge, as above the charger will not discharge with that much current. 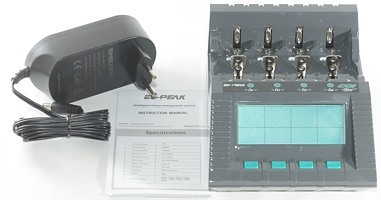 Refresh on this charger is a charge-discharge-charge sequence with user selected currents for both charge and discharge. The display shows the charge value. Again the low discharge current and the final charge includes trickle charge. 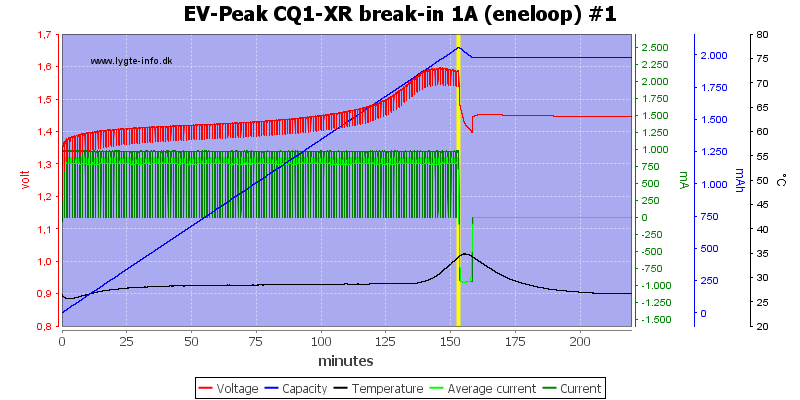 Break-in is a charge followed by a short discharge with user selected currents for both charge and discharge. The display shows the values from the short discharge. 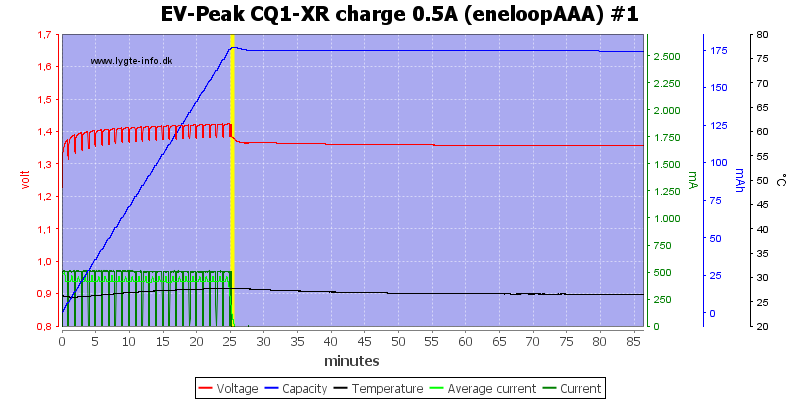 A normal charge, then a 5 minute discharge and this time there is no trickle charge. 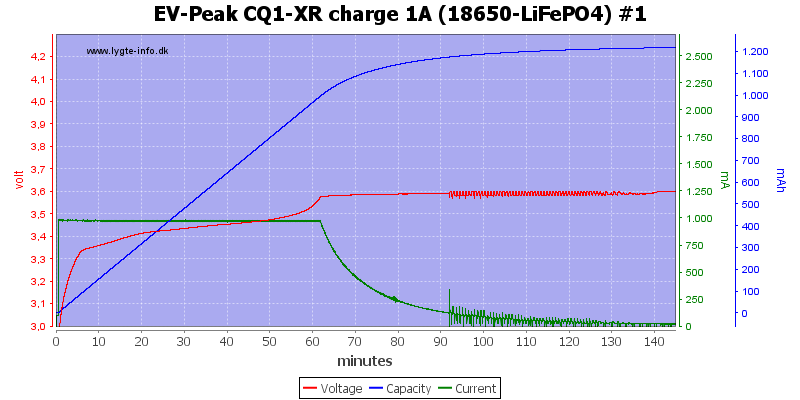 The charging current can be select from 0.1A to 2.5A when charging LiFePO4. 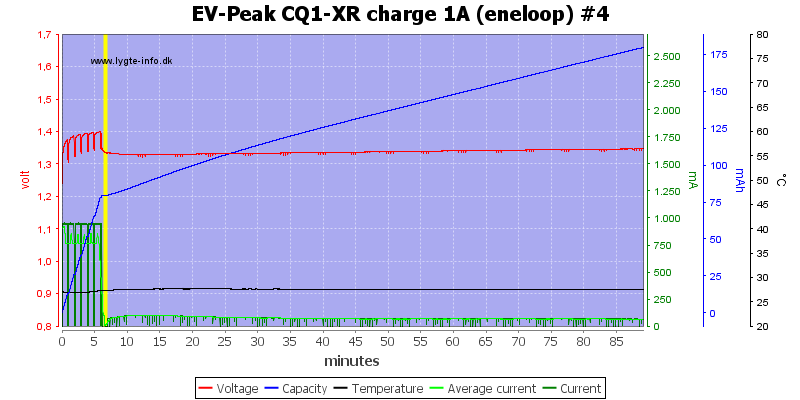 The charge goes nicely to 3.6V, but then the charger switches to trickle charge. This is also the case at lower current. The discharge current can be selected from 0.1A to 1.5A. 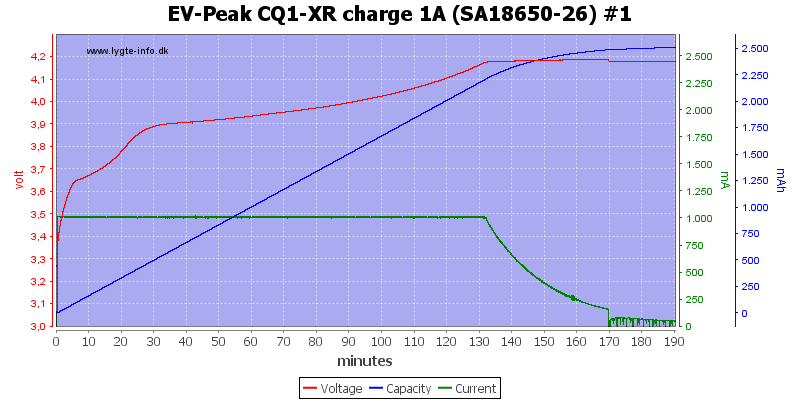 The current has the same problem as with LiIon, the charger will not use the selected current, but only discharge with about 0.4A. Sorry, no curves for this, it is basically the same as LiIon, but with changed limits. 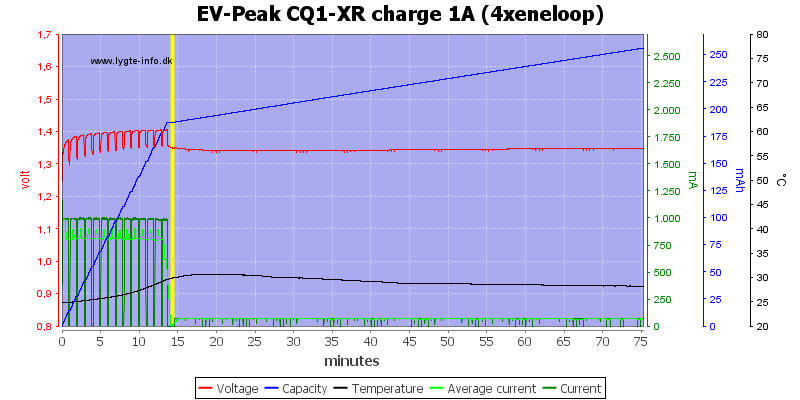 The current can be adjusted from 0.1A to 2.5A for NiMH charging. Not as nice, the charger terminated way before the cell is anywhere near full. And even more failed. This curve would have been fine if I had started with a full cell. 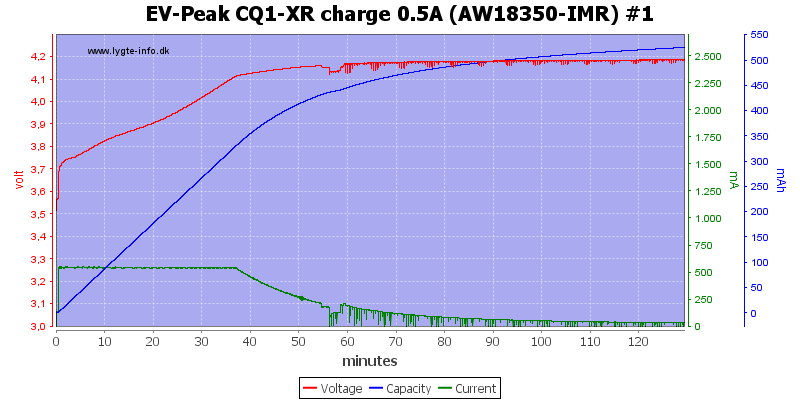 Notice that the charger is applying some trickle charge here. 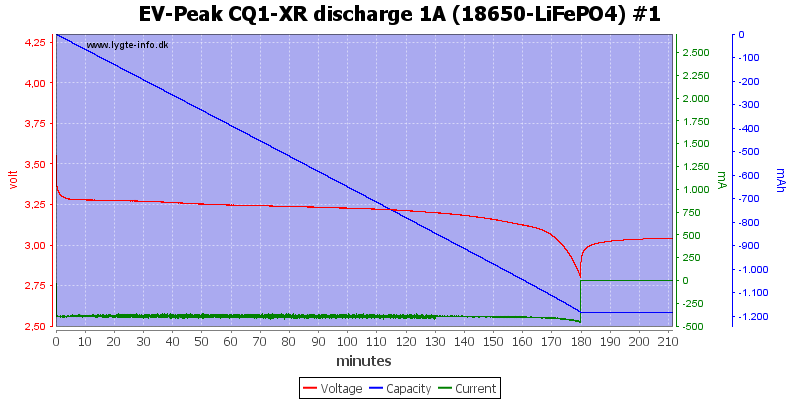 The two high capacity cells also failed, one of them get a trickle charge. What about a very low charge current? The cell get charged nearly 3/4 full. The termination may be due to a time limit. The AAA cell do not get charged either. With 4 cell at a time it also fails. And it fails even faster at full charge current. When charging NiMH it first do the internal resistance check and then goes to full charge current, no low current charge here. But about each minute it takes a break, probably to check the voltage, but the display shows the voltage during charge, not the voltage during the break. The break is present at all NiMH charge current settings, this time it decided my cell was full. Same at 2.5A charge current. It is possible to select discharge current from 0.1A to 1.5A, the 1.5A is not possible. 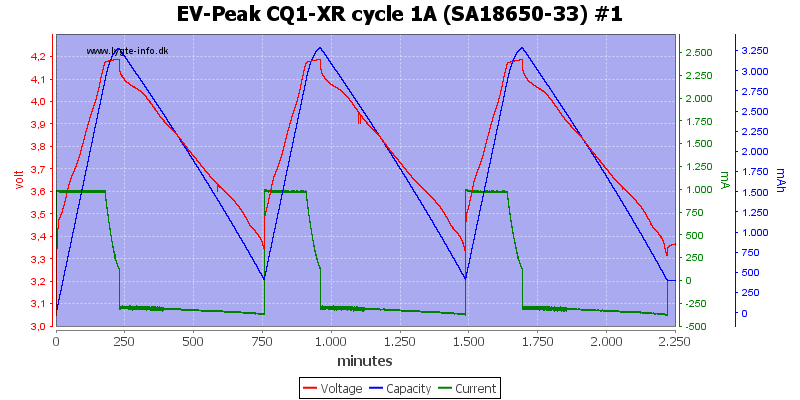 The termination is at about 1.25V, this is very high for NiMH cells, the reason is likely a time limit. 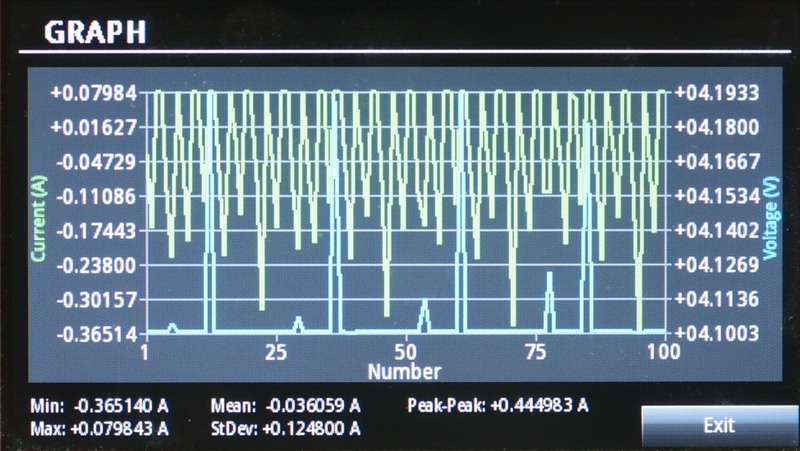 With the higher termination current the discharge curve looks fine, it terminated at 0.9V. The discharge current is about 1A, even with 1.5A selected. Doing a discharge with four cells looks good enough, but again the current is limited to about 1A. 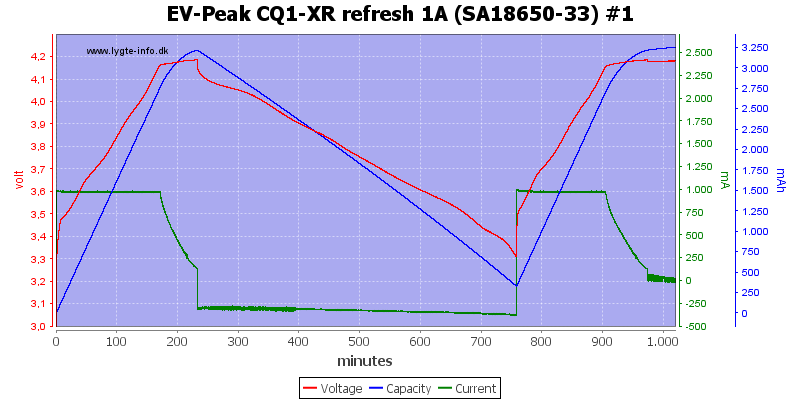 No PWM in low current discharge. 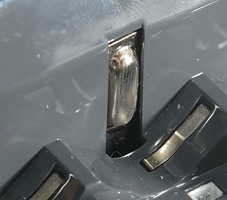 High current discharge is limited to 1A. 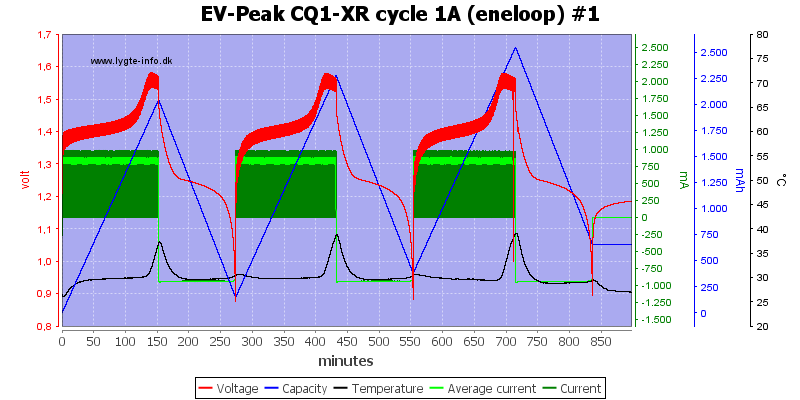 For cycle it is possible to select number of cycles (1-12), charge and discharge current and initial operation (Charge/Discharge). Starting with a charge I will end with a discharge. This time the charger works perfectly. 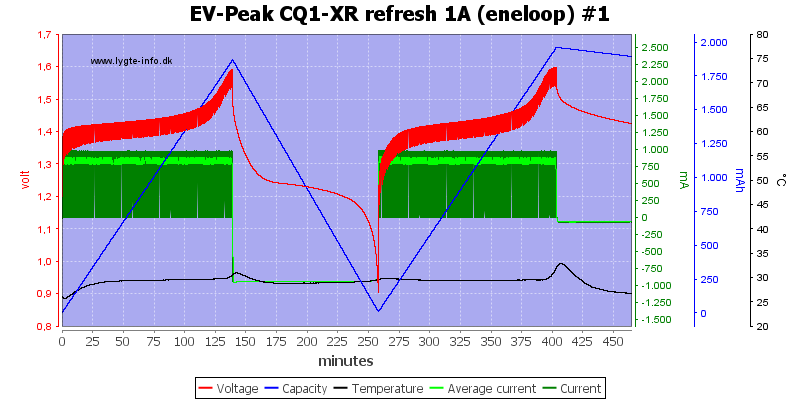 The refresh operation is a charge-discharge-charge sequence with user selectable charge and discharge current. The first charge looks like it terminated a bit early, the second charge looks perfect. 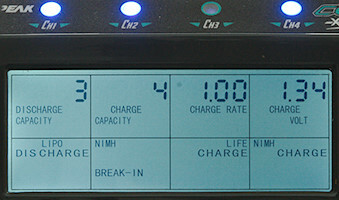 The break-in operation is a charge followed by a short discharge, it is possible to select charge and discharge current. A nice charge followed by a 5 minute discharge. 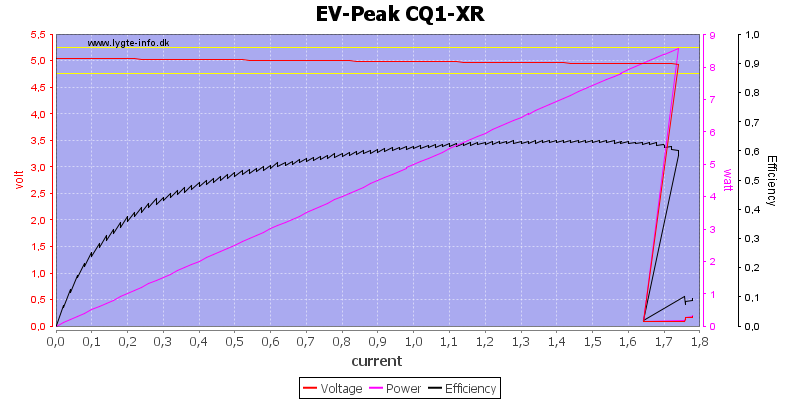 Power consumption when idle is 1.4 watt (Power adapter alone is 0.1 watt). The display has no indication about the usb output. 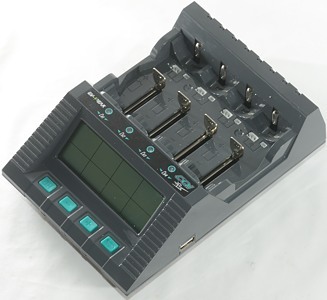 The charger can easily deliver the rated 1A current on the usb output, but it do not live up to the 2.1A coding. Efficiency is also rather bad, it is not very surprising with the high idle power consumption and two switchers (One in the mains adapter and one in the charger). The charger can deliver the rated current for an hour without problems. 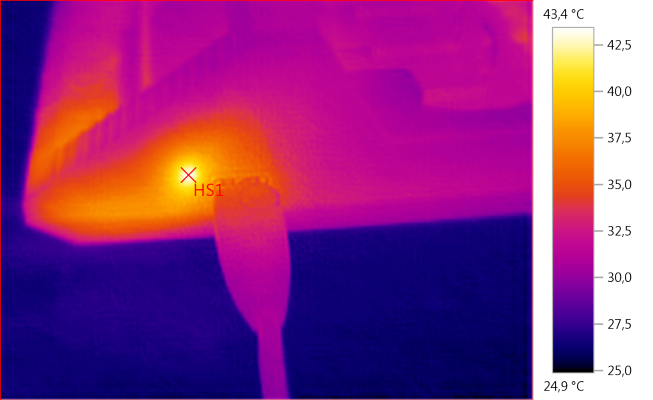 Not much heat get to the outside of the charger with the usb running at full rated power. The noise is 20mV rms and 95mVpp. The noise is 20mV rms and 120mVpp, this is very low values. At first glance the charger looks interesting with the usual selection of analyzer function and also connection for small LiIon batteries. It often restart when charging a full load of LiIon batteries. 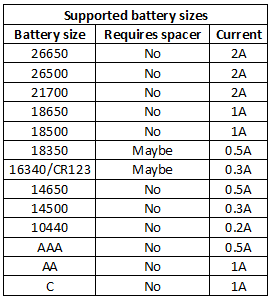 It cannot reliable charge NiMH full. It do not terminate on LiIon charge. The discharge current settings are fantasy, it cannot discharge at these currents (A detailed reading of the specification will reveal that). 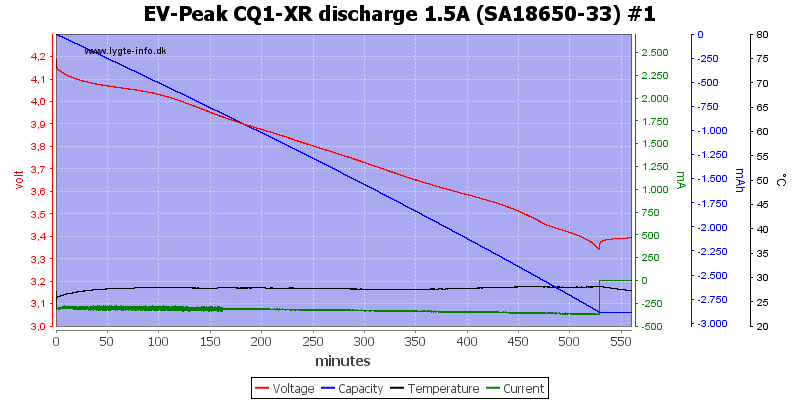 The break-in algorithm is not the standard one with only 5 minute discharge. This make the charger usable for charging a few LiIon cells at a time or analyzing a small LiIon battery pack. It is not usable for charging NiMH.